You have probably arrived at this page because you are based in Audlem or in the surrounding towns and villages and require a certified fire resistant roller shutter product. Westwood Security supply a range of certified Fire Shutters to customers in Audlem and our products can provide up to 4 hours of fire protection. All Westwood Fire Shutters are fully tested, approved and certified. For all of your fire shutter requirements in the Audlem area, look no further than Westwood, the No.1 supplier of Audlem Fire Shutters. Call us right away for a no-obligation quotation. We have extremely short lead times for new fire shutter products and we are able to provide extensive help and advice regarding your overall fire and security protection strategy. So don't hesitate to contact us over any matter that may occur to you. We are a friendly, approachable company and are more than willing to to help in any way that we can. Our business success is based on referred business and our aim is to provide and end-to-end solution for your security needs. We manufacture Single and Twin Skin Lath Fire Shutters tested to Exova Fire and Safety BSEN 1634-1 in Warrington, UK and providing up to 4 Hours of fire resistance. The Double Skin Insulated Lath offers additional heat radiation protection. Call for further details. Established in 1994, Westwood Fire Shutters have been installed for literally thousands of satisfied business customers nationwide. Our Fire Rated Shutters are manufactured by specialist teams in our own modern factory in the North West. With our satellite bases around the country and from our London depot and our head office and factory in Manchester, we offer an unrivalled national reach. We promise a quick turnaround for new Fire Shutters in Audlem and in emergency situations will do our best to offer a same-day replacement service. 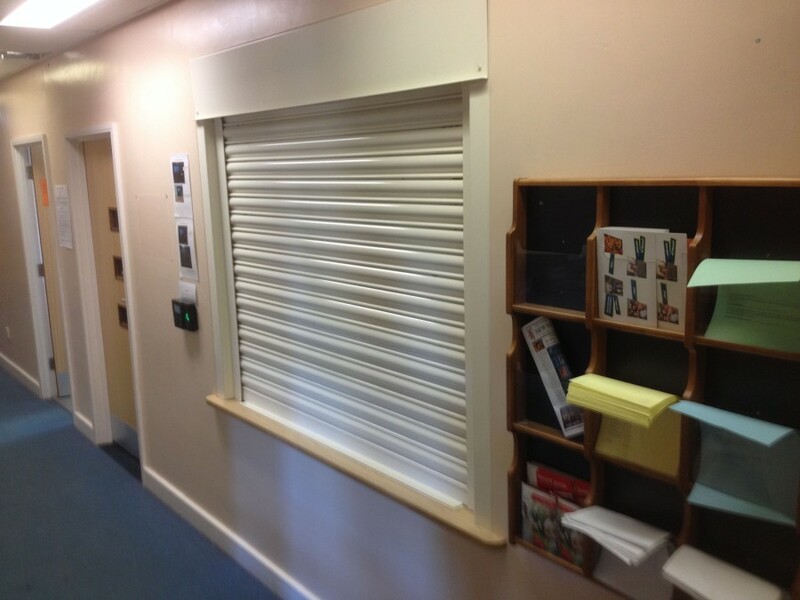 For supply only we can offer a next day overnight Fire Shutter delivery service. Westwood vehicles are covered by Navman tracking systems provided by Competitive Tracking. For your peace of mind, we know where all of our teams are at all times, so in real time we can tell you exactly when your Fire Shutters will be with you. Fire Shutters protect your premises for up to 4 hours greater than would be the case for a standard non fire rated roller shutter door. They can be used to section off and protect a particular part of a building from fire, the whole building, or even provide protection between floors. 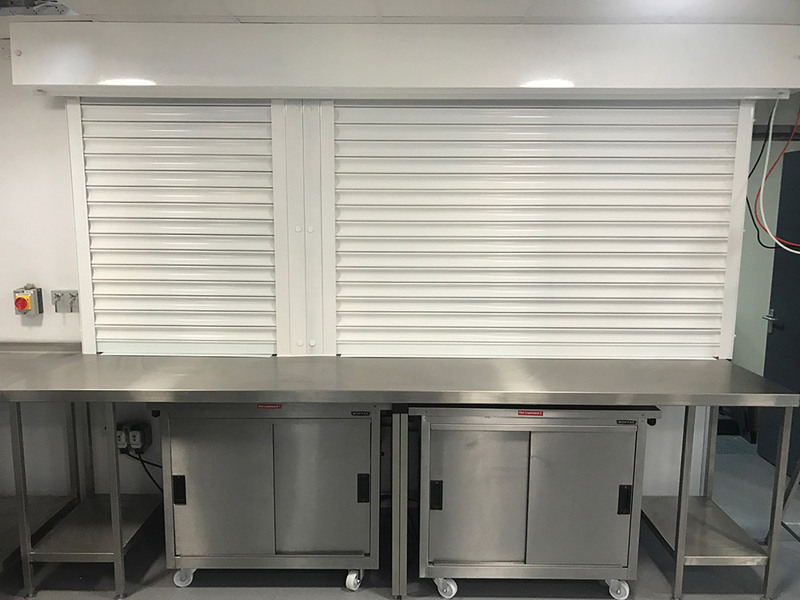 Fire Shutters offer outstanding levels of fire protection for goods, buildings and employees by creating significant delay to the spread of a fire. Many businesses are forced to close as insurance companies often refuse to meet claims because building regulations and Loss Prevention Council requirements have not been met. Fire Shutters from Westwood Security are the perfect way to ensure compliance. There are three main methods of automatic operation. A fusible link involves the use of solder as connection in the circuit: heat radiated from a nearby fire causes the solder to melt and this activates the door. A fire relay means that the Fire Shutter or Fire Door is connected to the fire alarm system. When the alarm is sounded, the Fire Shutter activates. Finally, a delayed Audio/Visual Warning used in connection with the Fire Shutter is connected to the alarm system, and operates usually with a time delay very similarly to a fire relay. During this delay an additional alarm is sounded, warning those in close proximity to the door that is about to close, thus allowing them to exit the affected area. Building regulations in Audlem require that openings in fire resisting walls or partitions must have a door with an equivalent fire rating to that of the wall or partition. Option 1 - Fire Shutter Panel with 24 volt activation and single alarm, driven down by mains power supply. Option 2 - As Option 1 but including a UPS power supply for use in the event of mains power failure to the Fire Shutters. 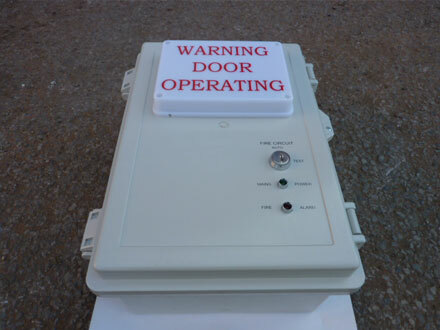 Option 3 - Fire Shutter Audio/Visual Panel, delay and split level drop with a 24 volt brake release gravity fail safe system. Check out our product ranges in our Fire Shutters Image Gallery, of just contact us for further details. We appreciate that you require a Quality Service at a Competitive Price!